I bought a copy of the Gathering Storm: Fall of Cadia, but haven't had a chance to fully read through it yet. My understanding is that Cadia is somewhat destroyed and everyone escapes into a Webway portal at the very end with the help of some odd looking Eldar. This is Yvraine, Emissary of Ynnead. I'm assuming that she's some sort of high priestess of the new death god. She's obviously a psyker as the cat only hangs out with psykers. It's a slick looking model. This dude is The Visarch, Sword of Ynnead. 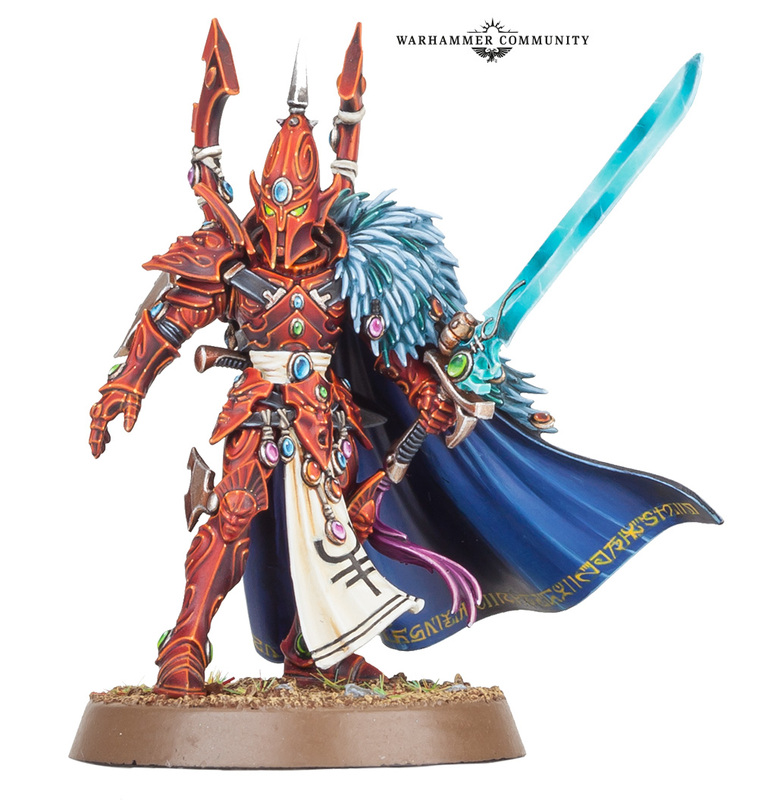 I'm guessing that he's the "Chosen" warrior type guy who protects Yvraine OR controls the mortal Eldar who are dedicated to fighting for Ynnead. The model is a little static. I feel like his one arm should be pointing or something. This is The Yncarne, Avatar of Ynnead. 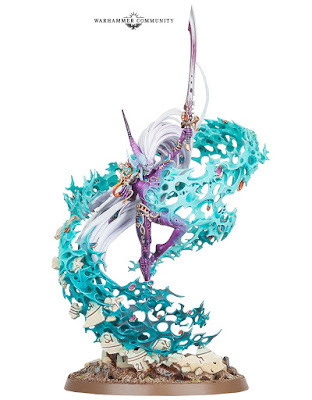 This dude looks VERY much like a Slaaneshi model, which makes sense as Slaanesh is an Eldar thing. 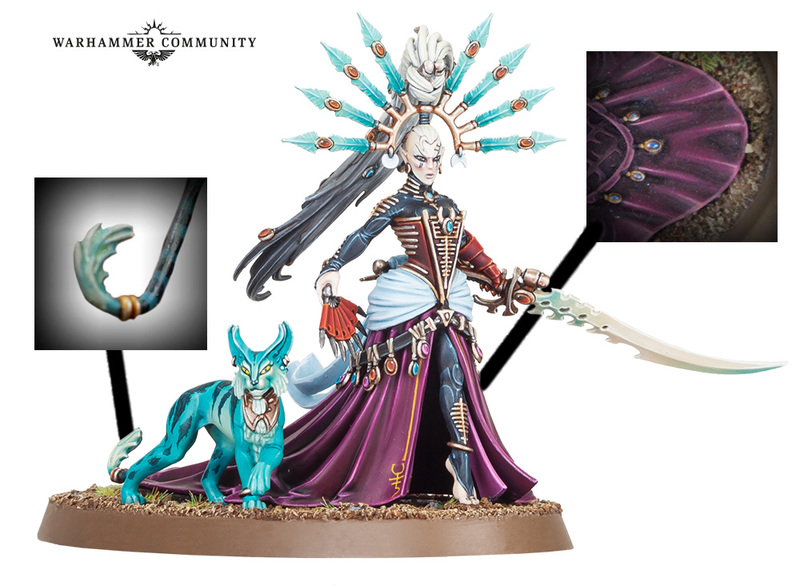 I don't know the full story, but I think Ynnead is intended to protect the Eldar's souls and possibly kill Slaanesh in the process. These models make me very optimistic about the Gathering Storm Part 2: Fracture of Biel-Tan story. Biel-Tan is known for having lots of Wraith contructs, which also means they have lots of soul stones. I'm assuming that these stones power Ynnead's birth. 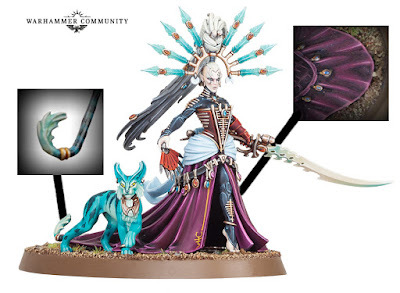 After all, in the model, those are Eldar soul stones swirling in the blue stuff.